notice of this little town once it came into Bishop Absalon's hands. The convenience of its harbor made Copenhagen an attractive conquest to many foreign powers. Everyone from the British to the Swedes wanted a piece of Copenhagen. This once sleepy fishing village is now one of the most popular tourist destinations in the world. The people are friendly, the waters remain pristine Nyhaven Canal in Copenhagen and the buildings are beautiful. the seat of the Academy of Arts. Copenhagen is a city that is best seen on foot or bike. 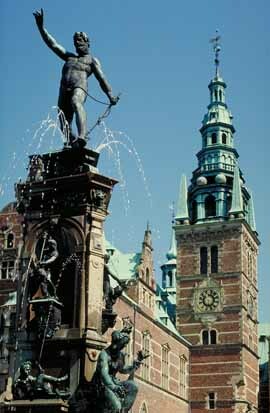 Vacationers can explore on their own or join any of the Frederiksborg Castle in Copenhagen city's numerous organized tours. Everything is in such close proximity to each other that it literally feels like you are at one minute in the present and the next minute in the past. Children and adults alike will take great pleasure in Copenhagen's most famous daughter. The Statue of the Little Mermaid is located in the Copenhagen Harbor. The statue was erected in 1913 as a tribute to the popular children's fairy tale written by Hans Christian Anderson. The best place to visit while in Copenhagen is definitely Tivoli. A pantomime theatre, open-air stage, restaurants and concerts make this area the cultural heart of the city as well as the most beautiful. The gardens, exploding with different colored tulips, will take anyone's breath away. On most nights, spectacular fireworks light up the sky while thousands of colored lanterns glow throughout the area. Outdoor lovers will find an abundance of things to do while in Copenhagen. Bellevue Beach is a popular spot as are the city's many public pools. Beautiful sculptures and opulent tiles make swimming at the Frederiksberg Ponyudlejning a unique and stimulating experience. When it comes to dining, vacationers have the luxury of choosing between a wide variety of restaurants. Even the most discerning palate will leave a dining experience feeling completely satisfied. After dinner, tourists can take a romantic moonlit stroll through the city. Music lovers will be happy to discover that Copenhagen takes their jazz very, very seriously. 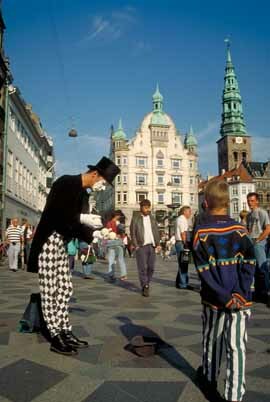 Street Performer in Copenhagen City Square There are also a large number of nightclubs that are perfect for dancing the night away. 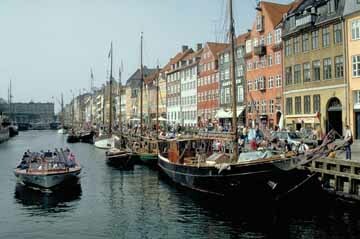 Everyday cruise ships from all over the world enter Copenhagen's harbor, depositing throngs of vacationers. 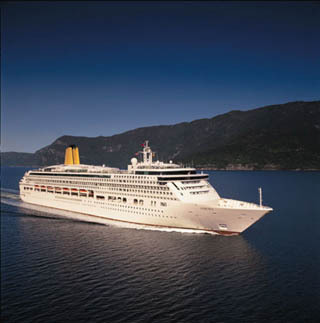 Ships belonging to many different cruise lines make Copenhagen a stop before continuing on to other exciting European cities. Other cities include Rome, Venice, Barcelona and Cannes.